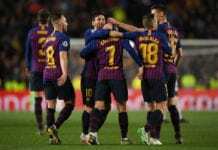 The former Barcelona footballer has revealed what the Argentinean is like as a person after playing three years together. Yaya Toure played for Spanish La Liga giants Barcelona for three seasons, as the Blaugrana won two league titles and one UEFA Champions League trophy. Toure then moved to the English Premier League side Manchester City. And with three years playing together with Argentina national team superstar Lionel Messi, Toure has described today how Messi was as a person. “He is different and special,” Toure told The Daily Star. “You give him a pass with two or three players around him and it is so difficult to get the ball from him,” he explained. “To train with him, he adapts to you and you have to adapt to him. When you play with him, he will win trophies. He always wants to play in all the games,” he concluded. 35-year-old Yaya Toure retired in 2018, after spending his football career in seven different teams. He started playing professionally in Beveren in Belgium in 2001. He then moved to Metalurh Donetsk, Olympiacos, and AS Monaco. He spent three seasons with Barcelona from 2007 to 2010, before leaving for Manchester City. He ended his career with Olympiacos in Grecia. Previous articleQuiz: How much do you know abou Patrick Kluivert?